AC Milan and Parma played easily the most exciting game of the week, with AC Milan winning 5-4 away. AC Milan had a two goal lead three times with Parma pulling one back each time. Jeremy Menez stood out for Milan, scoring this filthy goal and a penalty along with five dribbles. 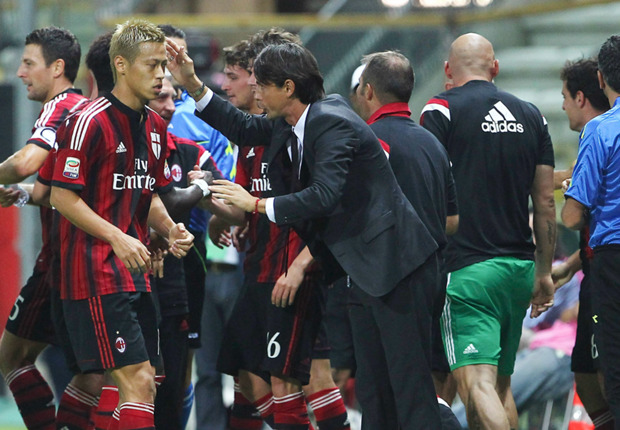 Keisuke Honda also contributed to two goals by scoring one and providing the assist for another. Both teams also had a centerback sent off: Felipe for Parma and Daniele Bonera for Milan. We don’t know how long it will last, but AC Milan is top of the table right now. Internazionale ravaged Sassuolo, to the tune of a 7-0 beatdown at the San Siro. Mauro Icardi had a hat trick but wasn’t even the most impressive player on the pitch in Milan. That title belonged to Pablo Osvaldo, who bagged two goals along with two assists. Mateo Kovačić also managed to get his first Serie A goal along with an assist and four dribbles. Napoli suffered a frustrating home lost to Chievo Verona. Despite 72% possession, 86% passing and outshooting their opponent 33-8 and earning a penalty they still lost. Chievo managed to block an impressive 12 shots and Gonzalo Higuain’s penalty was saved by Francesco Bardi. Juventus took care of business like any defending champion should against Udinese. They held Udinese to a grand total of one shot on target along with having 57% possession. Carlos Tevez was the key man on offense, grabbing a goal and an assist. Despite only taking five shots, Roma went to Empoli and grabbed a 1-0 win. Luigi Sepe’s own goal proved to be the difference. This entry was posted in Serie A and tagged AC Milan, Daniele Bonera, Jeremy Menez, Keisuke Honda, Mauro Icardi, Milan. Bookmark the permalink.